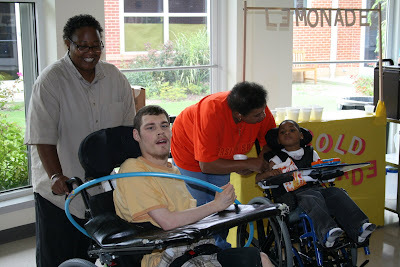 There are few lazy days of summer at St. Mary’s Home for Disabled Children. Residents stay busy going to summer school and camp and taking part in a variety of other activities in the evenings and on weekends. This afternoon, though, residents and staff dropped by the Atrium for a little snack-and-music break. Crystal Anderson, who runs St. Mary’s kitchen, mixed up some lemonade. Mamie McCloud, an occupational therapy technician, built a lemonade stand, recycling some old boxes. The mother of one of St. Mary’s residents donated popcorn, and staff tried out their Hula Hoop skills and dance moves as music blared from a portable stereo. In the photo, that’s Crystal standing next to Wayne, who’s got a Hula Hoop, and Mamie leaning over Jahmari.